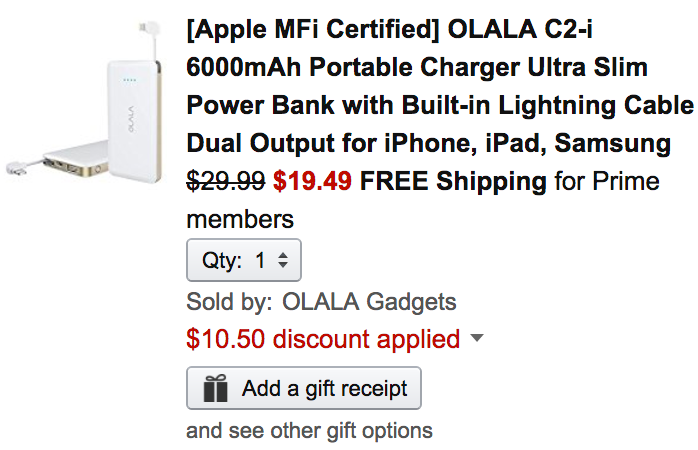 OLALA Gadgets via Amazon is offering its 6000mAh Power Bank w/ built-in MFi Lightning cable for $29.99, but if you use the code D75ZK492 the price will drop to $19.49 Prime shipped. That’s more than $10 off and the lowest we’ve seen for it at Amazon. With this power bank, you won’t have to worry about taking a Lightning cable with you to charge your Apple devices. It also has 4 small LEDs that tells you how much juice is left for charging. Rated 4.1/5 stars by over 300 Amazon shoppers. We still have the SanDisk 64GB USB Type-C Flash Drive for $23 Prime shipped and SanDisk’s iXpand 32GB/64GB USB 3.0 Lightning Flash Drives from $28. Built-in Cable— Convenient built in lightning cable design, charge on the go. MFi Certified— Charge with confidence, more compatible & reliable. The built-in Apple Lightning Connector has been licensed by Apple so it is 100% compatible with your Apple devices and it means you don’t need to bring an extra cable. Dual Output for Charging The USB output 5V 2.4A enables you to charge your second device at fast speed simultaneously. LED Power Indicator Check how much juice left to know the charging status. Power ON Control Press the side power button to begin the charging.